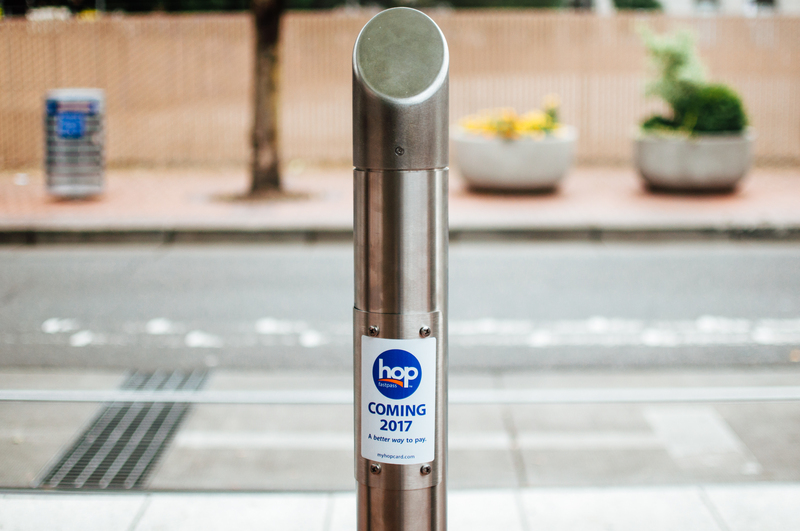 Before the end of 2017, riders will be able to hop on board transit in the greater Portland-Vancouver area using Hop Fastpass™. Hop Fastpass is an electronic fare system that will make paying for transit fast and easy – just tap a smartcard on a reader to pay for the ride. It will be valid on C-TRAN buses, Portland Streetcar and all TriMet buses and trains. “Hop” conjures up both the image of a rabbit, known for being fast, and the hops that have led our region to be named Beertopia and for Portland, Beertown. E-fare will make paying for the ride easier. Just tap the Hop Fastpass card on an electronic reader and go! The electronic readers will be available on all C-TRAN and TriMet buses, onboard all Streetcars and at all MAX and WES stations. Hop Fastpass will speed up boarding and more! Hassle-free – no need to carry cash, have exact change or keep track of a paper ticket. Convenient – load value by phone, web, at retail outlets, or set up automatic reloads. No bank account, no problem – load value at one of more than 500 retail outlets (grocery/convenience stores and pharmacies), including TriMet’s Ticket Office. Lost-card protection – value is stored in your account, so a lost card doesn’t mean lost money, as long as your card is registered. With Hop Fastpass, you pay as you go. Once you reach the cost of a Day Pass, currently $5 (the same amount as two 2 ½ hour tickets), the rest of the rides that day are free. Same is true on a monthly basis. Take as many rides as desired, but once you reach the cost of a monthly pass, the rest of your rides that month are free. For someone who rides every day, after day 20 the rides would be free. This feature is perfect for riders who want the benefits of a monthly pass but without the upfront cost. To learn more about Hop Fastpass and sign up for email updates, go to myhopcard.com. This is an ideal time to modernize our fare collection system for all riders. The system will also support customers tapping Apple Pay, Google Wallet and contactless bank cards. Some features like the “pay as you go” monthly pass are only available using the Hop Fastpass card. Once the Hop Fastpass system launches, we expect riders will welcome the ease and convenience of e-fare. Cash fares will still be accepted on C-TRAN and TriMet buses, at ticket machines on MAX platforms and on the Portland Streetcar system. 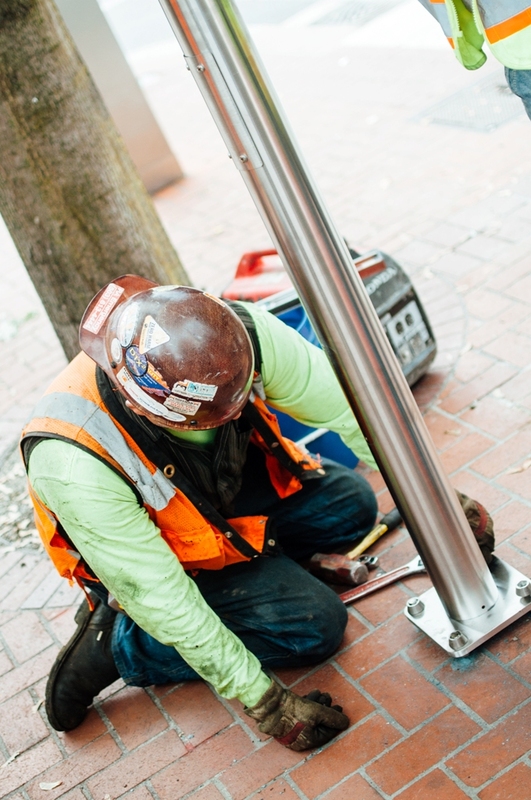 Construction on TriMet rail platforms enters a new phase this week, and unlike the first phase, this work will leave behind a sign of the e-fare system to come – stainless steel masts. Crews have been laying the foundation for the system, putting in the underground equipment necessary to power Hop Fastpass card readers on the platforms. Once that work was done at a station, it was hard to see any difference. While that work will continue at about 30 stations in the months to come, at other stations crews will begin installing the masts that will hold the electronic readers. Riders will see other e-fare equipment going in on board C-TRAN and TriMet buses, as well as Portland Streetcars, sometime in 2016.